Cycling, walking and rapid transit systems are associated with a wide range of health benefits that need to be reflected more systematically in transport and development policies. Health benefits may include: reduced risk of heart disease, some cancers, type 2 diabetes, and some obesity-related risks from more physical activity; reduced health risks from urban air pollution; reduced traffic injury risks and less noise stress. Rapid transit, walking and cycling systems also improve access to vital jobs, services and opportunities and ease the mobility of vulnerable groups, such as children, people with disabilities, and older adults, enhancing health equity. 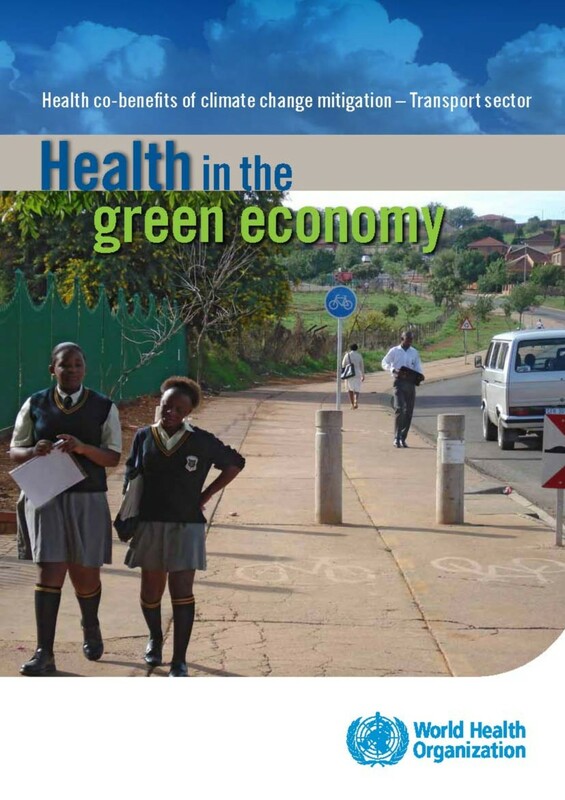 This report, part of the Health in the Green Economy series, considers evidence regarding health co-benefits, and risks, of climate change mitigation strategies for transport, as reviewed by the Intergovernmental Panel on Climate Change. "This report makes an important contribution to the transport, planning, health and climate change literature by sign-posting the need to assess co-benefits and co-costs of transport and land use planning interventions. With reference to the IPPC work, many of the implications of a technology-linked transport sector emissions mitigation agenda for public health – considered very broadly – were identified." this report has emphasized the important role of health consideration in transport planning and infrastructure provision. With its series of concepts and models on the interrelationship between transport, climate change and health, it would help developing countries to justify and/ or benefit more from CDM finance globally. 5) Awakening a new health interest in Sustainable Transport Planning"